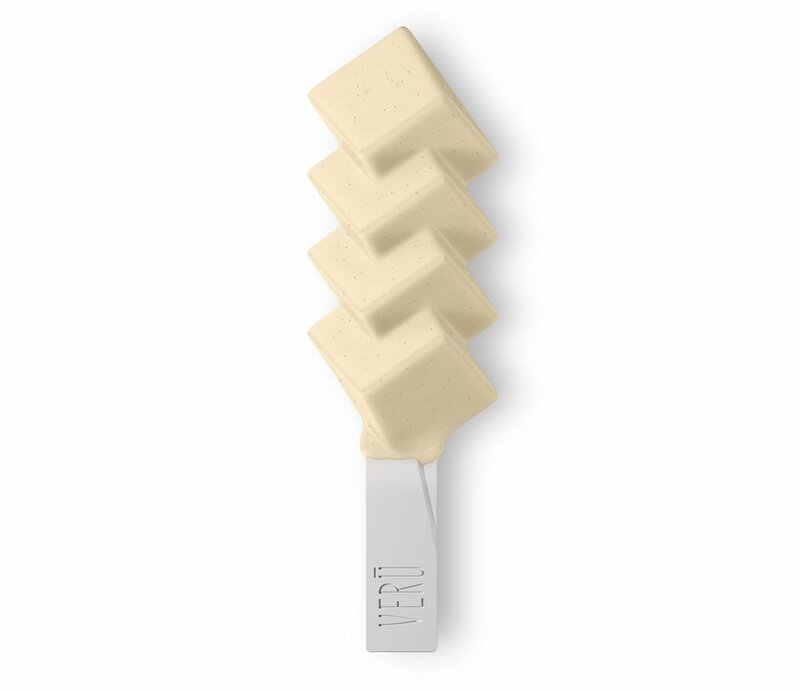 The new VERŪ Organic Ice Cream Bars. No artificial flavours, colorants or emulsifiers. Real fruits for unreal taste. Blackcurrant puree 35%, skimmed milk , raw cane sugar, cream , passion fruit juice 3% , stabilizers (locust bean gum, guar gum). Skimmed milk, mango puree 30%, passion fruit juice 12%, cream, raw cane sugar, stabilizers (locust bean gum, guar gum ). Organic, EU / non-EU agriculture. The product may contain traces of gluten, egg, peanut, soy and nuts. Skimmed milk, cream, raw cane sugar, skimmed milk powder , stabilizers (locust bean gum, Guar gum), bourbon vanilla extract, coloring food (carrot concentrate, apple concentrate), ground bourbon vanilla pods. Our ice cream bars with real alcohol. … or due to our new and patented production process, which enables us to prevent large ice crystals forming by using liquid nitrogen to accelerate the freezing process – and not by fat, emulsifiers and stabilizers as in conventional ice cream production. The ice cream never directly comes into contact with (liquid) nitrogen during the production process. However, the air we breathe contains up to 80 % nitrogen. Liquid nitrogen (which is basically a liquid form of the air we breathe) has a temperature of - 196°C. It is also tasteless and colorless. After releasing its cooling energy it evaporates completely and mixes with the air we breathe – cycle completed. No need to worry! Liquid nitrogen has a temperature of - 196°C, which helps us to generate a rapid temperature drop during the ice cream production process. The time required for freezing determines the formation of ice crystals and therefore the quality of the ice cream – and we managed to shorten the freezing time considerably. As a result, we produce very high quality ice cream with incredibly intense flavour while preserving all the nutrients and vitamins. The ice creams never directly touch nitrogen during the production process, and they can be stored in a regular freezer at home. We don’t require special treatment. Thinking about it… we’d totally deserve it. But our ice cream can be stored in a regular freezer. - 196°C is only required for the shock-freezing technology used during the production process and not for general storage in the freezer at home. Emphasis lies on the letter »ū« including the macron (= overbar) to stress the vowel. (It’s not »ü« by the way.) Our name derives from the Latin word »Verum« meaning truth and honesty – just like the principles our ice cream intends to adhere to: No artificial additives and chemicals or whatever else you tend to find in other ice creams. Until recently the limiting factor of conventional ice cream production was the slow freezing speed. So to avoid the formation of noticeable ice crystals, the ice cream had to contain approximately 90% fat, air and sugar. Only 10% was left for taste, which made it hard to identify the ice cream flavour solely by its taste. Ever tried to distinguish a raspberry ice cream from a strawberry one with your eyes closed? Thanks to our new patent production process we no longer succumb to the outdated rules of ice cream production. In order to achieve an optimal feeling in your mouth, regular ice cream production processes try to avoid the emergence of ice crystals by adding air. However, we don’t get there by adding air, but rather by using our patent shock-freezing technology. The result is not only an incredibly smooth ice cream but also long-lasting pleasure (as less air in the ice cream and denser ice crystals significantly slow down the melting process). Don’t you hate it when your ice cream is melting and dripping down your hand right after unwrapping it on hot summer days? No more of that! Wooden sticks are unpleasant in your mouth. We don’t want something that feels strange in our mouth, whether it’s wood or artificial additives. This is why we decided to use the new decomposable, bio-degradable bioplastic ecovio®. It’s very hygienic, it doesn’t taste of anything and it has a more pleasant texture than wood. We also like that it is partly being made out of quickly renewable resources like corn. Since the outer wrapper also contains the same material as the stick, they can both be disposed and then decomposed at conventional compost works within a couple of weeks. Our ice-cream is extremely compact. Therefore we are not packaging any air and are able to save a lot of space during transportation. Thanks to our completely new stick we no longer need to use wooden sticks while the stick itself is still decomposable. Crazy, right? Our ice creams are free from artificial additives and our new production process requires neither chemicals nor high power consumption. Shall we continue? This is why we use innovative and environment friendly materials for the packaging, too. Our wrappers – just like the stick – consists of the new decomposable, bio-degradable bioplastic ecovio®, which is partly made out of quickly renewable resources like corn. Both the wrapper and stick can therefore be disposed of and then decomposed at conventional compost works within a couple of weeks. The outer package is made out of cardboard. Our new production process uses liquid nitrogen, but consumes a lot less energy compared with regular ice cream production. However, the liquefaction of air – and therefore the production of liquid nitrogen – requires a lot of energy. In summary, the energy consumption of our entire production process is comparable with conventional ice cream productions. However, our big advantage is that we don’t use chemicals during the freezing process. And this, in turn, protects our environment. And because this special design provides more air supply to the mouth while you lick the ice cream, resulting in better flavour. Due to the very small and dense ice crystals inside our ice cream, the additional oxygen transfer generates an even more intensive taste.